A few months back I found this track: “Trapped” by Graham Blvd on the iTunes store. I have been searching for this track for years to no avail. I’m pretty sure that I had heard the track in the 80s when I was growing up, but my love for the track first developed after Boards of Canada did a remix of it(“Trapped” by Hell’s Interface on the MASK 200 EP). I was quite surprised to have found this track on iTunes, as their selection of rare/obscure titles from the 70s and 80s is a bit lacking. I usually turn to Google when researching older tracks, but for the first time Google came up short…really short! In fact, I can find no information about Graham Blvd on Google at all, which is quite surprising. This brings us to the main issue/subject of this post. 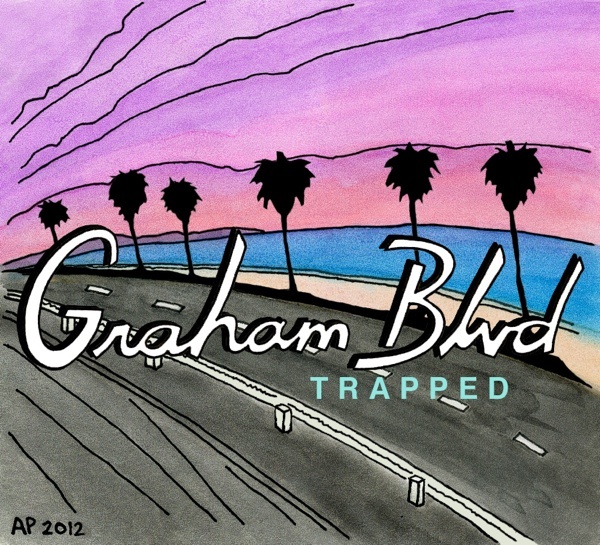 While I love the track “Trapped” by Graham Blvd that I bought from the iTunes store, I absolutely despise the cover artwork that comes with it. Unfortunately, “Trapped” comes as part of one of those “hits of the 80s” compilations, specifically…the album is called “R&B Hits 1980s Vol. 13″. I suppose the artwork isn’t altogether dreadful, but it certainly leaves something to be desired. This is especially true when flipping through my album artwork on my iPod touch. You flip through various well designed covers and all of a sudden…there is this garish Pink, red, and white “R&B Hits 1980s Vol. 13″ cover that ruins the experience of flipping through all of the previous well designed albums covers. I decided to remedy the situation by drawing, painting, and designing my own album cover for the track “Trapped” by Graham Blvd. Also, I’ve decided to share the cover art with the denizens of the net. So, if you decide to by the “Trapped” track by Graham Blvd on the iTunes store, you’ll have the option to get a nicer looking cover(nicer looking in my opinion). *Click the image above to get the full sized version. Since there wasn’t that much information about “Graham Blvd” the group/artist(s), like from where they hail, how the group formed…etc, I decided to go with a California coastline Blvd, palm trees, beach, and sea. Essentially it’s a coastline/scene that I admire as aesthetically beautiful, and even if Graham Blvd hails from somewhere completely unrelated–the UK, Cleveland, or wherever–I think that the artwork still holds up as a nice looking cover. We don’t have to be that literal do we? Tips: In case you want to keep the “R&B Hits 1980s Vol. 13″ cover, iTunes allows you to add multiple pictures to audio files. Just “get info, cmd + i” on the the file in iTunes, move over to the artwork section, and then drag in the new cover(the old cover will be preserved). I generally make MP3s out of my purchased iTunes tracks so that I can have MP3 CDs for the car. In which case, I leave the original purchased iTunes AAC files alone. That way if I don’t like the cover, I can just erase it on the MP3 and add in a different one, and the original purchased ACC file is untouched. It’s up to you how you want to do this; the process is really straight forward. Do all of this at your own risk. If you lose the the original artwork for whatever reason–that beautiful “R&B Hits 1980s Vol. 13″ cover–I won’t be held responsible. Copyright: Okay, so I’m not going to do a long drawn out copyright like I did for the previous post…it’s not necessary. In the previous post I wrote a EULA style copyright. I did this to see if I could write a professional(ish) EULA style license. In any case, it was way to long and drawn out–as most legalese is–and it’s completely unnecessary given the content that I’m putting out. Bottom line: Use the artwork, do what you like with it, but if you modify it throw me an email, tweet, or whatever with a link so I can see what you’ve done with it. At the very least, link back to the post on this site. I guess you could consider this a BSD style license. * I’ve been really busy with other things(programming, web development/design), and my posting has suffered. Not to worry though…I’ll be posting more regularly. Well, I’m going to try to post more regularly. – To download the iTunes sized Cover Art click on the image above. – To preview/download(buy) “Trapped” from iTunes click: here.